Business is still booming for Gov. Bruce Rauner and his wife Diana, who reported more than $58 million in income in 2014, according to a joint tax filing released by the governor’s office on Friday. The Rauners reported $58.3 million in total income on their federal return. Their adjusted gross income was $57.5 million. They paid $15.2 million in federal taxes and $2.8 million in Illinois taxes, according to the filing. The governor’s office did not release the schedules for the filing, which provide information on interest income, mortgage interest and charitable deductions. But in a news release, the governor’s office said the Rauners made $3.3 million in charitable contributions. Last October, Rauner’s office released four pages of his 2013 tax return, also without the accompanying schedules. That filing revealed the Rauners took in $60.8 million in income, up from the $53.4 million they reported making in 2012. In 2011, Rauner reported $28.1 million in income and in 2010, $27.1 million. 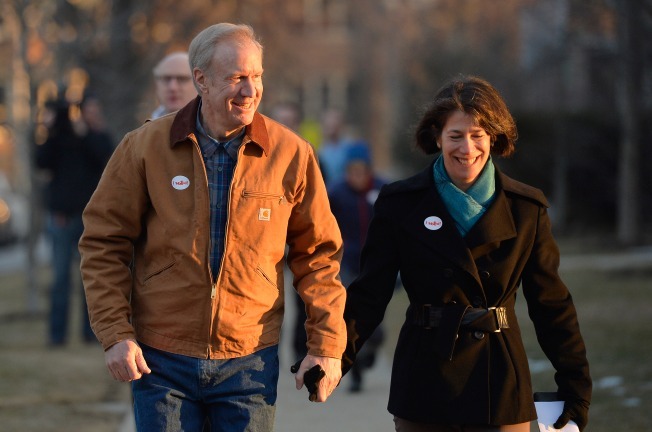 In October 2014, Rauner was in the midst of a contentious campaign against former Gov. Pat Quinn. Quinn’s campaign at the time questioned why Rauner didn’t release his entire tax return to the public.